This was Wales. Land of our Fathers, home of rugby and dragons, miners and persistent soul-sapping rain and drizzle - and we were in the heart of the beast. Yes, Godendingdangdag had moved from the increasingly pub-less town of Usk and into the 21st century world of Firestorm Games bespoke new(ish) gaming centre and "exit through the gift shop" retail emporium. This was to be a re-enactment weekend. The games were standard competition-format L'Art de la Guerre 400 AP doubles matches, but we were re-enacting our successful performance from Burton the previous year by using almost exactly the same army although with different shields for the Roman infantry (who were now Early Imperial) and no flakey and underpowered Elephant & Gladiator command either. The EIR is the most textbook of textbook Roman armies - Lorica Segmenta armour, square shields with LBMS transfers, and Elite Armoured Legionaries backed up with aggressive Auxilia for rough terrain and in this incarnation a surprise Parthian ally. The Judean army allied to them was a mirror image, with slightly more underpowered imitation Legions, spear and swordsmen instead of Auxila and Armenians instead of Parthians. The end result was 2 heavy foot commands, 2 rough terrain commands and 2 heavyweight mounted commands. Simples. The lists for the Early Imperial Roman & Judean and Chinese Northern Dynasties & Chi'ang from this game, as well as all the other lists from the games at Godendag can be seen here in the L'Art de la Guerre Wiki. The opening game saw the forces of Rome and her allies deployed on a blasted lunar-like plain (probably literally in the case of this table) which was almost entirely free of obstacle and encumbrance. Facing us on this bald surface was an army even more straightforward than our own - Chinese border horse nomads and a wall of cataphracts stretching clear across the whole field of battle. The terrain is that of the Steppes, leaving the Romans and Judeans no-where to hide. 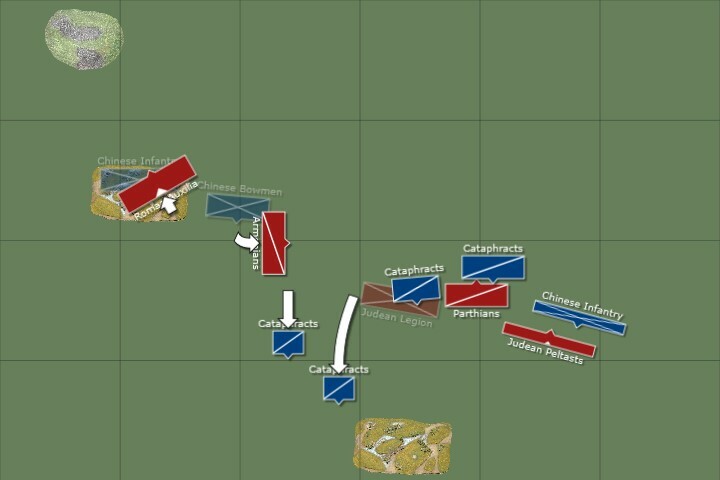 They have formed a solid block of troops to take the expected Cataphract charge, offset to the left so as to - potentially - make it difficult for the unweildy Cataphracts to concentrate their forces against them. The Roman Auxilia are a target in the open in this game, and so have deployed opposite a field, optimistic that they can reach it before heing overrun by horsemen, and even more optimistic that the enemy will have placed poor quality "filler" troops in the terrain. This indeed turns out to be the case. The Steppe hordes advanced coherently as our thin screen of skirmishers popped up like the first early daffodils of Spring to try and create time and space for the rest of the army to work out what on earth it could do against such a seemingly uniformly competent aggressor. On the far left the Roman Auxilia (from Donnington - the manufacturer, not the town in Lincolnshire) had been deployed opposite one of the few patches of terrain, and they at least had some sort of proper pedestrian opponent to face off against in the form of allied Chinese foot of dubious origin. Scrum Down Lads! Cataphracts are the unweildy, fully armoured battle tanks of the ancient cavalry world. Their key unique feature is "Heavy Armour", which is unique in the pre-Medieval period and means they almost always benefit from a +1 if they lose a melee against any other troop type in period, making them highly resilient. They can take 3 hits, like other mounted troops, and have the "Impact" ability against foot, giving them a +1 in the first round of combat against most types of infantry (the effect of this is however cancelled if they charge into stationary spearmen). Hand in hand with "Impact" for mounted troops always comes "Furious Charge", so if they beat infantry in the first round of melee they also inflict an additional hit. Their base combat factor is +1, but they go up to +2 against LH and LMI (ie squishy bowmen and javelinmen). Against shooting they have better-than-average "Protection" factor of +2 (the benefit of armour to "protection" factors is - a little confusingly - built into the quoted "protection" factors for mounted, but is added to the base "protection" factors for each type of foot). They are also "unmaneuverable", and so anything other than a forward move takes extra pips. A similar - but more agoraphobic - faceoff was in play on the opposite flank, as the Judean rough terrain command looked in vain for any rough terrain, but then breathed a sigh of relief to find that this far from the centre of the table the Nomads had run out of Cataphracts in much the same way as the Welsh edition of Countdown regularly exhausts its entire supply of just 3 vowels, and had themselves extended their line with a formation of eclectic dagger-axe men similarly unsuited to the open plains. The Armenians initiated the first charge of the morning, and the Nomads were sent scuttling away in a lengthy and effective evade back towards the safety of their own Cataphracts. The threat of shooting was removed - at least for now - but more importantly the usually-rubbish Roman cavalry now had space and a protective shield of Cataphracts behind which they could wheel round, leaving them facing the flank of the oncoming Chinese wall of armoured horsemen! The Chinese forces have flooded forward in a coherent line of Cataphracts, but their arguably over-confident infantry have also failed to resist the temptation to use the pips they have been gifted, and have also stepped up. The Roman alliance in response is pushing forward on the left wing, seeing an opportunity to get into the softer underbelly of the Chinese army with Auxilia and possibly even the Armenian Cataphract command. The line of Legionaries is not keen to commit to battle, but it too needs to move up a little to avoid leaving the Armenians isolated and vulnerable to being overwhelmed. But already, in this line-em-up-and-go-friendly terrain, the decisive clash of the game was underway before the first round of tea (or, in the case of some players, beer) had been bought. Yes, Steppe cataphracts smashing into Roman and Judean legionaries on a broad frontage and teeing up for further engagement with the Parthians in the very near future. The Romano-Judean army had committed all of its battle troops and the Nomads still ended up with cataphracts to spare at the near end of the line, sending peltast spearmen into paroxysms of fear as they found themselves pressed into potential and imminent service as Medium Foot anti cavalry troops in the open (not good in any set of rules�). L'Art de la Guerre hint : The Cataphract/Legion interaction stacks up like this. 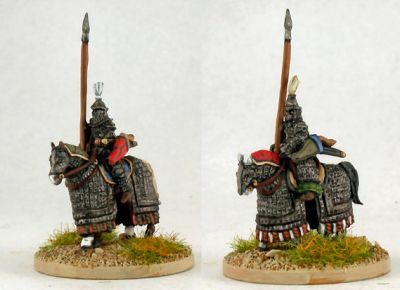 The Chinese Cataphracts are on a base factor of +1 vs Heavy Infantry, with an additional +1 in the first round for "Impact" - the effect of charging with a lance. If the Cataphracts win, they inflict the usual "1 hit for each difference of 1 or 2" in the final scores, PLUS an extra hit, but only in the first round because they have "Furious Charge"
If the Legions win the Cataphracts get to add a further +1 to any net losing score due to their heavier armour. The Legions are "armoured", but the Cataphracts are "Heavily Armoued"
This is not great for the Legions, but they are more resilient in the long run, as they can take 4 hits before exploding whereas the Cataphracts can only take 3. The sound of gently bleating sheep wafted across the Welsh countryside and into the venue as the second Chinese wave came rumbling across the plain and smashed into the Parthians. The whole strike force of the Chinese alliance was now committed against a (hopefully) solid line of Roman and Judean troops braced for impact. With the highly-priced Xiong Nu Cataphracts inevitably not being as numerous as the cheaper Roman and Judean infantry, the Romans had managed to extend their lines beyond the ability of the Chinese to match them, and led by Caesar himself the Legionaries stepped up smartly to a position in which they could turn onto the flanks of the Nomad horsemen. The Armenian allied cataphracts were also pushing forward, tempted by the prospect of Chinese medium foot in the open terrain to their front and also the chance to overwhelm some of the outriders for the Chinese formation. This flank was looking dicey for China, even as the Romano-Judean centre struggled to resist the waves of lancer charges. 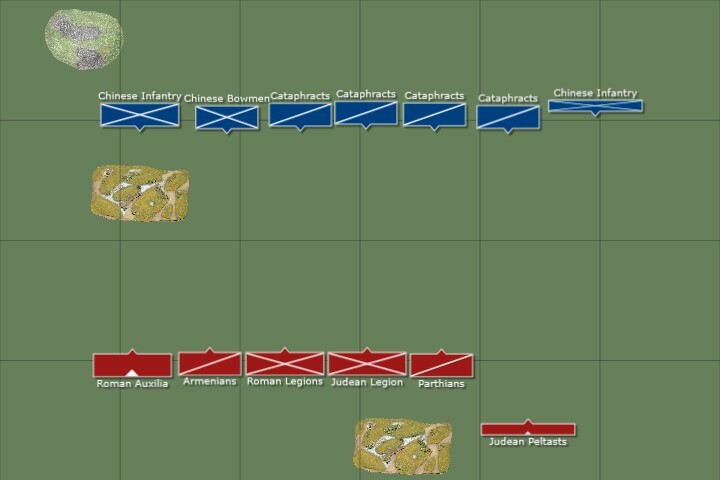 The two lines have clashed, and the highly costed Chinese forces are matched along the line by the Romans and their allies - but this leaves the Roman Auxilia relatively free to continue their advance into what is surely a weaker target ahead of them. With all of the Cataphracts occupied the Roman foot and Parthian have to hold on for as long as possible while the Auxilia do their thing on the left. The myriad harmonic voices of a male voice choir practicing nearby were starting to send a deep subsonic vibration through our chairs as the Legions started to take a terrible pounding, with gaps appearing as the Cataphracts simply crashed through at first contact, taking full advantage of the Furious Charge ability. Where the Romans and Judeans had survived things were little letter, with red-edged "3 hit" markers pointing to the units who were already close to destruction. But the end of the Chinese line was now crumbling as Legionaries turned their attentions to the flanks of the unmaneuverable metal-shod horsemen and hammered home their charge. More legionaries combined skilfully with the Armenians to overwhelm and overrun the scattered Chinese outliers and break through them and into the soft underbelly of Chinese infantry beyond. 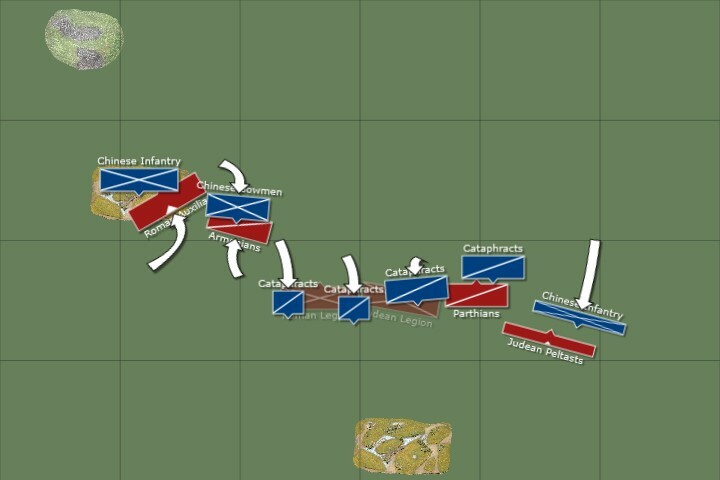 The centre of the Chinese alliance was rock-solid, but with all of those points invested in heavy metal there was surprisingly little remaining to defend the flanks. With not much else constructive to do, and wanting to stay out of reach of the Cataphracts some of the Roman Auxilia on the far left of the Roman-Judean line had been racing across the playing surface and even now were pinning skirmishing Xiong-Nu cavalry against the edge of the board with their speedy attack. As the last of the Judean Legionary infantry evaporated, their Commander faced the ignominy of being forced to retreat and join a unit of skirmishing bowmen far from the action. L'Art de la Guerre hint -Rules Hint: Commanders who have not "joined" (as opposed to just being next to) a unit to contribute to its fighting capability (adding +1) cannot usually be "killed" in ADLG, however if the unit they are with is killed they have to jump to the nearest friendly unit in range. If there are no friendlies nearby they are eliminated! The Xiong-Nu Cataphracts were getting their act together, regrouping and forming a coherent line to push out from the flanks of the huge salient they had carved in the heart of the Romano-Judean army. Proper Legionaries exposed their LBMS transfer-clad shields to the camera as they responded by creating their own linear firebreak against the Chinese attack. The Chinese have smashed through the Roman-Judean infantry centre, leaving only isolated pockets of troops in their wake. This however has not come without losses for the Chinese, and they are now struggling for command and control as they seek to regroup their scattered forces and find another target. Some horsemen are making for the baggage, others are still engaged against the Parthians. 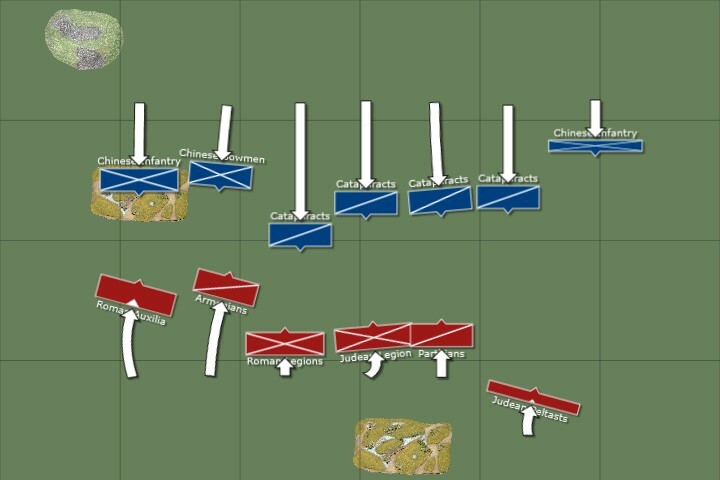 On the Roman left the Armenians and Auxilia have both pushed past the line of battle and found more numerous, weaker targets to attack and are racking up the victory points at a rate of knots. The flanks were still proving much more enticing for the Romano-Judean alliance - even though the Armenians were making slow going of it against the enemy foot, the command and control of 2 Roman commands was allowing their troops to dance around the Chinese who's Generals were all largely committed to the Cataphract charge, and the combination of fast moving Auxilia and Armenian horsemen was looking like it may soon prove too much for the static Oriental infantry. The Roman Auxilia unleashed their powerful "Impact" charge onto the eclectically-attired Chinese infantry, drawing them out of a field which did nothing to help them against the MF Romans anyway. Some of the victorious Xion-Nu Cataphract lancers had given up on the thought of influencing the rest of the battle, so large was the hole they had carved into the Roman lines. Instead they opted to go on a baggage-hunting expedition, racing forward past the desultory shooting of the Roman LF bowmen, who even urged on by their General had no real possibility of shooting down the armoured horsemen. 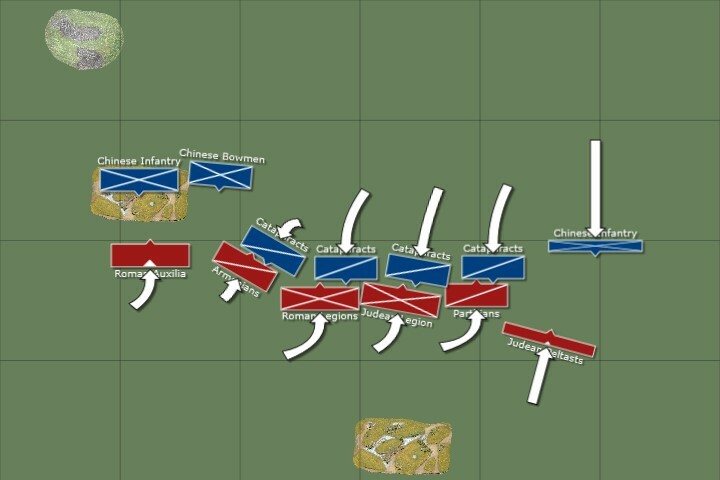 The Auxilia were still making hard going against the variegated Chinese infantry, but the occasional breakthrough did mean their greater command and control could soon expect to see some devastating flank attacks take place. This eagle-eye view filmed from a small Chinese drone bought on eBay shows just how extensive the hole punched in the Judean part of the army was - but on the left flank the Romans are standing firm, as their Auxilia and Armenian allied forces chew up the soft underbelly of the Chinese forces, and on the right the surviving Parthian Cataphracts and Greek-style spearmen are also ganging up to outflank and roll up the over-stretched Chinese infantry. As the Chinese push out from their central salient the Parthians and Greek-style foot push even harder and faster into the end of the Chinese infantry line, retreating away from the advancing Cataphracts over a pile of dead Chinese pedestrians. Beyond them, in the hinterland of the left flank, Chinese casualties were adding up alarmingly as the Auxilia cut a swathe through the filler of the Chinese forces. The other side of the central salient was still holding firm, with stoic Legionaries aided by Armenian Cataphracts proving a sufficient match for the scattered units of Chinese horsemen. A faint smell of stewed leek permeated the air as the Chinese broke into smaller and smaller units, they gave up flanks and bases - the imminent charge by the hitherto probably considered as useless Roman Horse would be enough to finally tip the Chinese army over the edge into defeat ! The Auxilia and Armenians have overrun the Chinese infantry on the left of the battlefield and this carnage has, in combination with the attritional losses inflicted on the Cataphract force, finally brought the Chinese juggernaught to it's knees. The Romans have suffered horrific losses, especially among their infantry, but the smaller Chinese force is the first to break. The Result is a narrow but decisive victory for Rome and her Allies! My oh my, this was a hard fought match. The terrain fell about as badly as could be imagined for us, which was a terrible start, and then this huge wall of armoured horsemen was not really the sort of enemy we wished to fight on a veritable Chinese billiard table at all. I must admit to being somewhat dissappointed by the speed at which my infantry centre evaporated under this assault - the Judeans are not such good quality as the Romans, but I still expected their 4 hit points to make them last a little longer. Losing the first round, and suffering that extra attrition hit is clearly a big issue in working out how this interaction will pan out. Fortunately the brave and pokey Auxilia were there to find a chink in the Chinese wall of armour, and once they got into the reserve line infantry the outcome became far more rosy. Overlapping the enemy line with the Armenians was also a great boon, as I suppose the higher unit cost of the Chinese vs my Legions did mean I would end up with an advantage somewhere on the board. This was a hard-fought beginning to the weekend. Let's hope we don't fight any more walls of horsemen on a table bereft of terrain! It is however said that there is no great genius without some touch of madness, and in this one-dimensional army facing you across the table today I think that you faced both genius and madness. The sheer number of armoured horsemen was incredible, and had they kept their support troops more secure, and perhaps kept Generals out of combat I could easily have seen a different result here, leaving you at the bottom of the pool not the top of the pile. With man, most of his misfortunes are occasioned by other men, but here your misfortune was entirely self inflicted in not evolving your army choice at all from the previous year - this is now a sophisticated meta community you operate in, and so the mix of troops you have at your disposal will surely fight more mismatched opponents than these over the rest of the weekend. Nothing is more confidant than a bad poet, and the poetry of your victory pageant will rest heavily on the ear of anyone unfortunate enough to hear it - so lets wait until the next game to see whether your cadences are removed and hung about your ears by a more well-informed opponent. 28mm Napoleonic Perry Miniatures 54th French Line. Plastic and metal 36 figures.